PSP Blender is a scam! 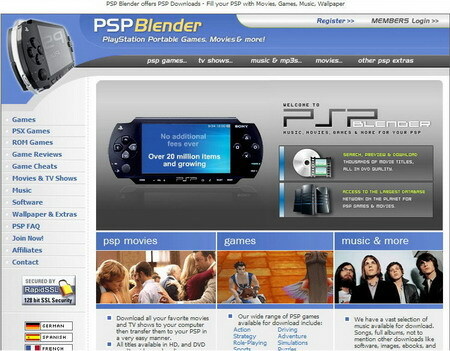 PSP blender advertises that you can download unlimited movies, music etc for a lifetime membership for 37.00$. Sounds great! So you registered and payed the 37 dollar membership fee. Then you try to download anything and you just get redirected to several pages, different download sites and ultimately just lands you to torrent sites. The people behind this site has also created a few bogus review sites which sing the praises of their own sites. They appear in forums posing as teenagers and even posts videos on Youtube saying how cool PSP Blender is. 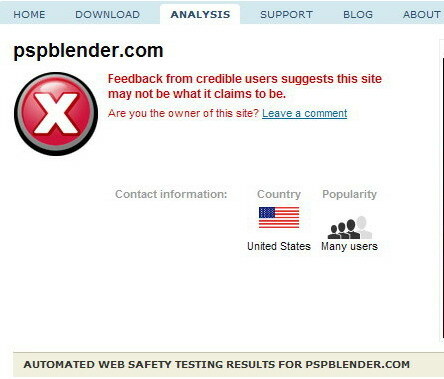 McAfee’s SiteAdvisor shows that PSP Blender received numerous complaints, and the site is now listed as a “Phishing or other scams” website. It appears there are tons of similar sites out there, and all of them seem to be as shady as this one. Next time you’re surfing the web, be mindful of scam sites. yeah pspblender is an elaborate scam to fool unwitting psp owners wanting to download free stuff. I totally agree with this. The home page looks great, then when you log in as a member all you get is links on the left that load up other people’s sites in a separate window on the right. Hi guys. I wished i have got to this page before i paid. I dont know much about it. I was impressed with the advertisement and paid for it. Now i regret. But i cannot do much. I am trying to get the money back. I dont know if that is possible. I almost got scammed by this site when i was still new to the PSP scene. Good thing i had double thoughts coz back then i still didnt knew anything about homebrew stuff. i dont know, what site is this? ive never heard of paid torrent sites except obviously for pspblender? Yes, and if you notice in YOUTUBE all the videos praising PSPblender have their comments disabled.. 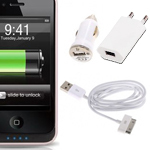 This website cost 37 dollars andall it is a websites that redirects you to different torrent sites. Xbone One Jailbreak via JTag is a scam! PS4 Jailbreak surfaces, makes waves, then found out to be Fake!